The ruling against Trump’s trans troops ban was a victory for facts and reason. Demonstrators protest President Donald Trump’s ban on transgender troops. There’s a lot wrong with America today but one thing that’s very heartening is to watch the supremely rational operation of the federal court system in action. 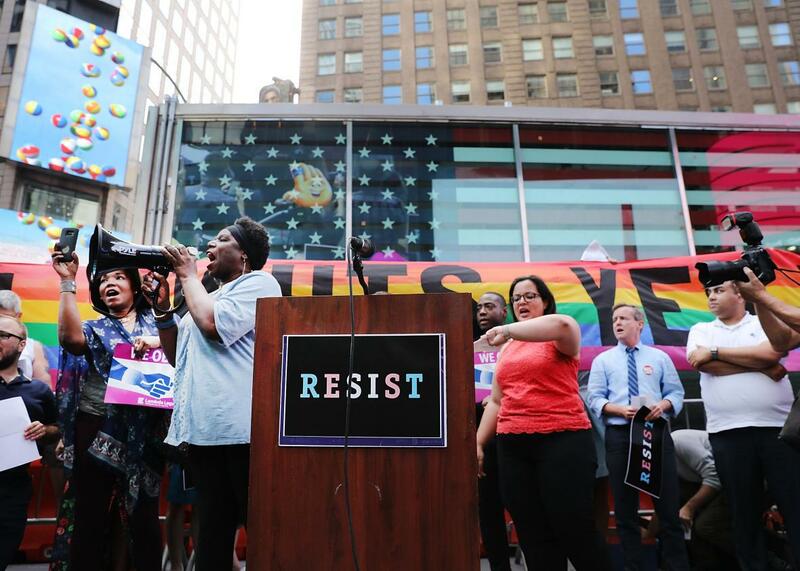 On Monday, the U.S. District Court for the District of Columbia barred the Trump administration from carrying out its ban on transgender service members. The preliminary injunction in Doe v. Trump enjoined the discriminatory policy from being enforced because the plaintiffs are “likely to succeed” in having the policy struck down as a violation of the Constitution’s equal protection guarantee. The decision—which is likely to be appealed—is not only a victory for the National Center for Lesbian Rights and GLBTQ Legal Advocates & Defenders, who brought the suit on behalf of several current and aspiring service members. It is a victory for the forces of truth and light that the Trump insurgency has gravely imperiled. To read the decision is to observe a stinging repudiation—with, for now, the force of law—of the Trump White House’s flagrant and constant disregard for truth, facts, or evidence. The devastating blows that Judge Colleen Kollar-Kotelly repeatedly delivers to the Trump trans policy can be so dry as to nearly escape notice. The government had sought to have the case dismissed by arguing that a military directive issued by the commander in chief deserves the highest level of “deference” from the courts—a routine step, but one that’s all the more unnerving coming from an administration with unprecedented contempt for both the norms and the constitutional requirements of democratic governance. Kollar-Kotelly wasn’t buying the deference argument for a simple reason: The deference doctrine says the courts generally defer to the “considered judgment” of Congress and the executive branch in matters of national security. But, said the judge, there was no considered judgment in this case. Trump chose to ban transgender service members in a tweet that took his own national security team by surprise, a characteristically impulsive effort to win political points with his base by bullying a vulnerable minority. The tradition of military deference, Kollar-Kotelly explained, grew out of cases like Rostker v. Goldberg, a 1981 Supreme Court case finding the male-only draft requirement to be constitutional. Contrasting the facts of that case with those of the current one, she explained that in Rostker, “Congress did not act unthinkingly or reflexively and not for any considered reason.” To the contrary, the challenged policy “had been ‘extensively considered by Congress in hearings, floor debate, and in committee.’ In other words, Congress had received extensive evidence on the issue, and simply chose one of two competing alternatives.” It was not for the courts to second-guess that considered judgment of actual evidence thoughtfully presented on the floor of Congress. The Trump trans ban, by contrast, lacked any serious thought or rational grounding. “The study and evaluation of evidence that the Rostker Court found warranted judicial deference is completely absent from the current record,” wrote Kollar-Kotelly. “Contrary to Defendants’ assertion, this does not appear to be a case where the Court is required to pick sides in a ‘battle of experts.’” The current commander in chief’s contempt for actual expertise is so extreme as to make the court’s decision a no-brainer. In fact, Kollar-Kotelly said, the Trump trans ban was based on nothing factual whatsoever: “On the record before the Court, there is absolutely no support for the claim that the ongoing service of transgender people would have any negative effective on the military at all.” The government, it seems, conceded this point when the president failed to make even the most cursory attempt to root his policy in actual facts, instead writing into his policy directive the fact that he had put the cart before the horse and sought to rationalize the ban after the fact. Recall how this all began. In late July, the president impetuously tweeted that the government “will not accept or allow Transgender individuals” to serve in the military because of the “tremendous medical costs and disruption” it would entail. A string of roving justifications for the ban then followed the announcement as the White House press secretary and others cast about trying to defend what was likely an off-the-cuff tweet that was now about to become policy. Trans troops would undermine “unit cohesion,” said Sarah Huckabee Sanders. Their medical care would cost too much, said allies in Congress. They would somehow “hinder military effectiveness and lethality,” said a White House memo meant to formalize the president’s tweets. At that point, the president stated that “further study is needed” before transgender individuals already serving effectively in the military would be allowed to stay there. It was a classic case of a policy in search of a rationale. This brings us to a final rousing chapter in Kollar-Kotelly’s paean to evidence-based policy. Like the ban on gay, lesbian, and bisexual service members before it, the transgender ban has been studied to death. The idea that further study—by the Trump team of all people—would yield any genuine additional insight into the viability of transgender service is utterly laughable. All of the reasons proffered by the President for excluding transgender individuals from the military in this case were not merely unsupported, but were actually contradicted by the studies, conclusions and judgment of the military itself. This week’s court decision is hardly the final word on transgender service, as this case and other lawsuits against the ban are ongoing. But if you’ve despaired lately over the ascendance of fake news, fake aspersions about real news, and policy and politics rooted in denial, deception, misinformation, ignorance and outright lies, read Kollar-Kotelly’s decision. Here, for a few moments, is a blissful reminder that the truth matters—not only as a high-minded principle to which a few old-timers quaintly aspire, but to the system of equal protection brilliantly constructed to endure—and that more often than not, it sides with justice.